Mississippi State was worse than bad. The projections for the Bulldogs were way down from the last few years, but the display of mediocrity put on by State was as poor as could be. Against a South Alabama team that was preseason #7 in the Sun Belt, the Bulldogs surrendered a 17-0 halftime lead, gave up a winning touchdown in the game’s final minute, and put a bow on the performance with two missed field goals in the final 6:03 including a 24-yard try with six seconds left. The Jaguars outgained Mississippi State 242-174 in the second half. South Alabama did its part to help the Bulldogs as much as it could. The Jaguars also missed a pair of field goals, and, after the go-ahead touchdown, South Alabama sent the kickoff out of bounds to give the Bulldogs prime field position with a full complement of timeouts remaining. In the end, it was all a fruitless exercise in agony for Mississippi State. It was just 664 days ago that the Bulldogs finished a five-week run at the top spot in the Associated Press poll. Today, though, was the bottom. South Alabama entered the game 19-31, with no winning seasons, in only four full seasons as an FBS program. USA quarterback Dallas Davis gashed the State defense going 24 of 34 for 285 yards and two scores, capped by a four-yard toss to Gerald Everett for the winning TD with 57 seconds left. It was Davis’ first college start. Everett led all players with with eight catches, and he had 95 yards. South Alabama’s Josh Magee led all receivers with 113 yards. No Mississippi State receiver had more than 40 yards. Now comes the questions for the Bulldogs. Was this team simply just Dak and friends? Can this team still be a factor, in any way, in the SEC West? If today’s performance is the new normal, the answer is a firm, inarguable, no. 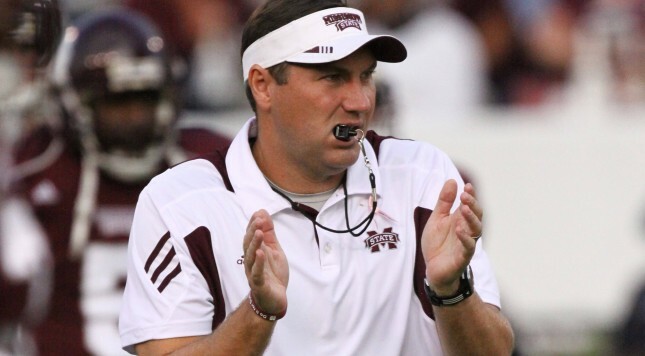 Dan Mullen will have to figure out how to right the ship because the pieces for a sinking are there. It has to start with consistent quarterback play, and the defenses will only get harder from here for Damian Williams. The Bulldogs go further down the rabbit hole coming up, as they open SEC play the next two weeks with games against South Carolina in Starkville before a trip west to play LSU.